As of Koha 3.14 the OPAC has a new default theme: Bootstrap. 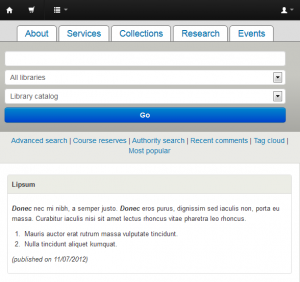 It’s a theme I developed with the intention of offering a flexible, modern, and responsive theme option for Koha libraries. It takes as its visual basis the CCSR theme, added in 3.10. 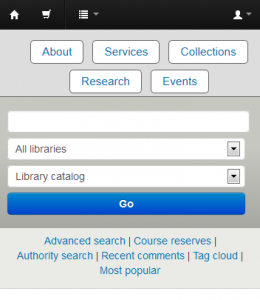 However, it greatly expands the catalog’s mobile-friendliness over the CCSR theme. Like the CCSR theme, the Bootstrap CSS framework offers something called responsiveness. This means that when the size of your viewport (for instance, the browser window) changes, the layout of the page changes in response. With a desktop browser you can see this by resizing the browser window. Users with mobile devices of varying sizes will see a layout more closely tailored to the size of the screen on their device. In the CCSR theme there is only one breakpoint. Breakpoints are the pixel dimensions at which the layout changes. When browsing a catalog which uses the CCSR theme, if the viewport size is below 700 pixels the layout changes to accommodate the smaller screen. Bootstrap offers a few more breakpoints. If you’re reading this in a desktop browser you can view this demo page and resize your browser window to see the effects on the page layout. In Bootstrap there are three primary breakpoints, for large, medium, and small screens. 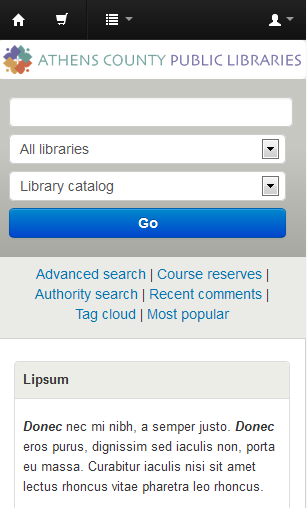 Koha’s new Bootstrap theme expands on these default breakpoints by adding a few more which are tuned to the layout of the OPAC. If you’re adding content to a region like opacheader or OpacMainUserBlock you’ll need to keep in mind that your content should respond comfortably to the same range of breakpoints that the rest of the catalog does. If you’re simply adding text this isn’t a problem because text flows naturally no matter the page width. If you’re adding something more complicated like images or navigation menus it will require some additional testing. 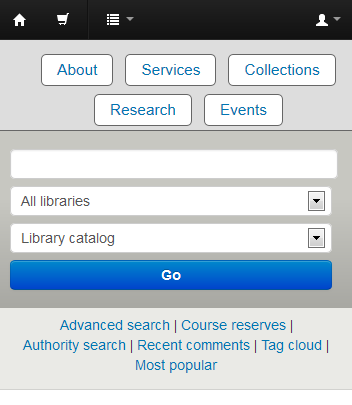 One of the more common items to customize in the previous default OPAC theme was the logo. 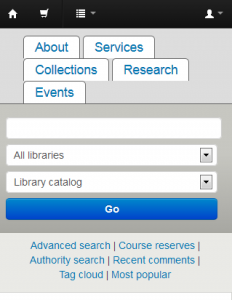 My first post here was on Customizing Koha 3’s OPAC logo. The Bootstrap theme no longer has an area designed specifically for a logo. The main search bar area takes up the full width of the screen. This makes it more adaptable to various screen sizes. There is a Koha logo in the “nav bar” region at the very top of the screen which could be customized using CSS, but it’s quite small and disappears at narrower screen widths. The opacheader region (customizable via system preferences) will probably be the primary customization option for adding logos, banners, custom top-level navigation, etc. A simple option is to add an image to the opacheader region. This is a simple option because the built-in CSS for images allows an image banner to naturally resize to match the browser width. This method uses the browser’s built-in image resizing algorithm. The result is fully-adaptable to various screen sizes. Now the tabs are styled one way when the screen width is above 600 pixels, and another when the width is below 600 pixels. I hope this example gives you a sense of what is possible when it comes to customization in the new theme. Planning your customizations for more than one screen width can be time-consuming, and lots of trial and error will be involved. The outcome, however, is a site which will be much more broadly usable. This entry was posted in Koha on March 6, 2014 by oleonard. Thanks a lot for this detailed guide, Owen. Extremely helpful for a web noob like me. Hi! Thanks for this great guide, and even more so for creating the awesome Boostrap theme! The tabs you showcase in the post made me think of the TinyCMS-functionality. 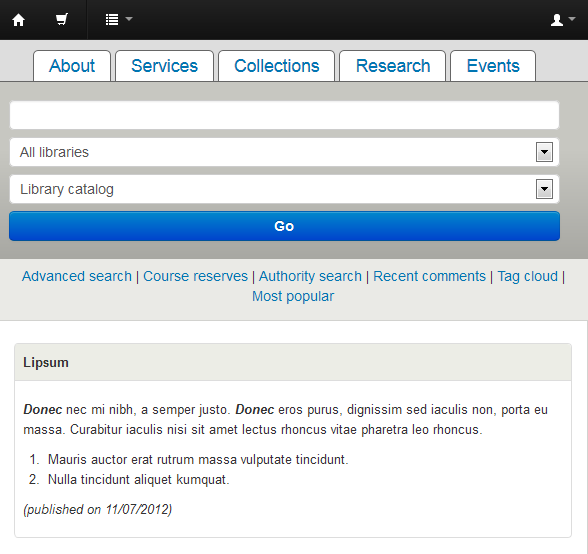 Do you know if this is still a valid way of using Koha as a CMS with the Boostrap theme? Or should one rather resort to just creating pages using the standard Opac look with the required content, placing them on the server and linking those nice tabs to those pages? Viktor, I don’t know much about Koha as a CMS. No one has done any development on that feature in quite a while, so I don’t know if it’s keeping up with all the other changes in Koha. It would be a good question to ask on the mailing list. Is there a way to make it so that the tabs go away completely when on a mobile display? I know it sounds crazy, but let’s say the links are just to canned searches and you don’t want them cluttering up the small display – how would we have them disappear on mobile but be tabs on the regular screen? 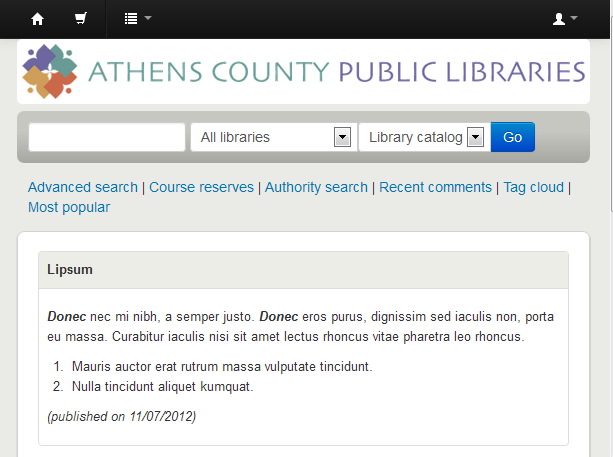 If someone drops by from a search engine – The CMS-functions I mentioned above is working quite well. Indrail Das Gupta has updated the instructions on the wiki to work with with Bootstrap and I can confirm that it’s working. Indrail seems to be working on a patch for cleaning things up so you can use an graphical editor for creating pages. Hi..I had my koha bootstrap theme turn on. But why doesnt work in opacnav, opacnavright and opacmainuserblock. It only works in poacheader. This is very helpful! Thank you for developing this. We are trying to remove the opacsmallicon (koha logo) in bootstrap and are having trouble, as opacsmallicon is no longer a system preference. How would you do this?